When I went back twenty-five years later there were walls and barbed wire and gates where none had been before. It was as if the Garden of Eden had been well and truly bolted shut, and with it my desire to return wilted. Earlier that week I’d knocked on the door to the house I’d grown up in and been invited for tea with the new owners; they’d changed so much of the house it was barely recognisable to me. Where once there was a vast lawn, now were a swimming pool and a granny shack at the end of the garden. The shack (more than a shack! – a whole house, really) hid the wall where the gooseberry bushes used to be. I thought: Revisiting one house is enough, so I didn’t try and get into my grandparents’ old house, nor did I linger outside the gates to peer into the garden. It will remain – because I probably will never go back to Port Elizabeth again – as it was for me when I was a young boy: a vast space of gardens and lawns and garages and fruit trees and servants’ quarters and rockeries and a porch with a pergola. Within all that: servants’ quarters. My grandfather’s domain was the garage, his garage. My grandmother’s garage was for her car, a black Triumph, and if there were other things in there, I don’t remember what they were. But my grandfather’s garage – the two garages sat side by side, close together, like the twin beds in their bedroom – his garage was a library of tools and spare parts and fishing equipment: tackle and reels and rods. The air was thick with gasoline vapours. 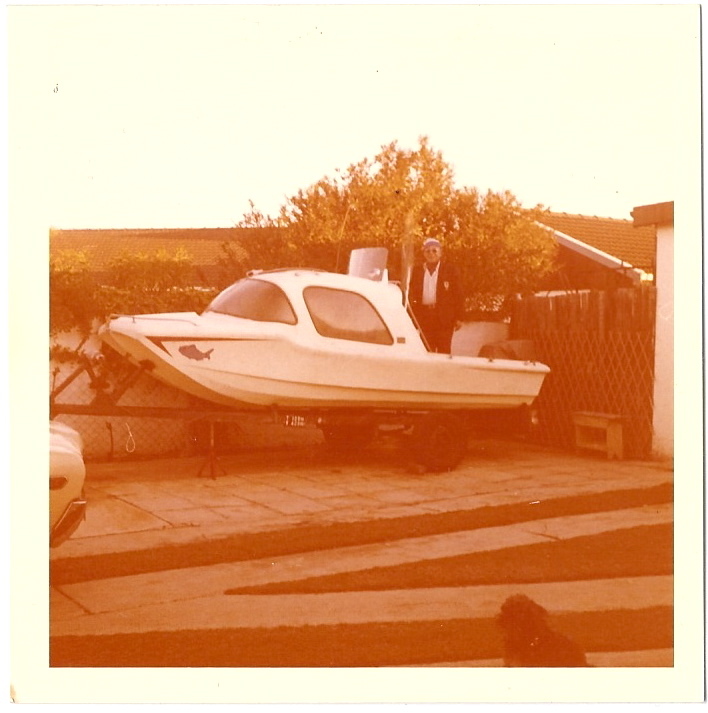 Just outside the garage doors was a large barrel which he’d fill with water and lower his outboard motor into, to check or fix or oil. My grandfather was a fisherman, a rugby player, a piano player, a reciter of poetry, a bigot, a bully, a boxer, a sentimentalist, an ex-alcoholic, a shopkeeper. He loved to hunt. And to fish. My grandmother liked to hike. To knit. To fundraise for the Women’s Zionist League. And she loved to garden. If I think of my grandmother, I see her making fudge, hiking along the promenade, swimming in the sea in her one-piece bathing suit, and I see her gardening. I see her planting things. I don’t remember her having someone to help them with the garden. And by someone I mean “a garden boy” – usually a grown man in a blue overall who mowed and did the weeding and whatever else needed to be done outside the house. Eden was a messy place. Violent and beautiful in equal measure. My grandfather called their house at 10 Bognor Street “Vredehoek” – meaning: the corner of peace. The sign that hung on the wall outside the house used to hang on the door of his old fishing shack on the banks of the Krom River. Not quite, but that’s more-or-less how I think of my grandmother’s garden. The lawns, the mulberry tree, the rockery, the gate that led up to the porch and front door, the driveway in front of the garages. At the back of the house were fruit trees, a kind of orchard, with apple trees and pear trees and plum trees, but I could be making this up. Beyond the trees, on the other side of the garden wall, was the house of the woman who was my nursery school teacher when I was much younger. Pam Leibowitz. I don’t think I ever saw her there or at my grandparents’ house, but I knew she lived next door and there was something about that fact that made me feel special. I remember a glamorous woman. Big waves of blonde hair, elegantly dressed. At a time when I couldn’t imagine teachers could be young – she was young. I don’t know how I knew that, but I did. Each section of the garden had its own character, was its own world. The section of the garden between the kitchen door and the servants’ quarters; the fruit trees in the section of the garden behind the house; the bit of the garden between the garage and the front lawn, most of that section taken up by a huge mulberry tree; and the front lawn itself, my grandmother’s domain. Back then, our gardens were our parks. Apartheid had made it possible for people like us to have huge houses with big gardens, and we moved between each other’s houses – my cousins, my grandparents, friends from school – without fear and without apology. We liked to play in other gardens because they provided the space for adventure that parks give us: surprising corners, trees to climb, favourite stretches, bits we keep coming back to. We played hide-n-seek, chased each other, had parties, climbed to the top of the jungle gym and hung upside down, swung on the swing, until the time when the swing toppled over and the frame fell on my head. Luckily, the maid was a trained nurse and bandaged my head. We swam in each other’s pools, every swimming pool had its own shape and character: a fountain, a deeper end, a diving board, a balcony to jump from into the water. Dive-bombs and belly-flops. My secondary school was just around the corner from my grandmother’s house. Sometimes after school I’d go and visit. We’d moved away from the neighbourhood by then and were living in Humewood, a short bus-rise away. I remember one afternoon in particular, maybe the last afternoon I ever went to see her; it might even have been in the weeks before we left the country. I don’t remember exactly when it was, but I do remember knocking on the kitchen door and my grandmother coming to open it. Thanks, Michelle. Your comment brought me back to the piece, which is nice to reread and remember – retread! I hope the Belfast park will make it into your memoir.